Honda has been the worlds largest motorcycle manufacturer since 1964. 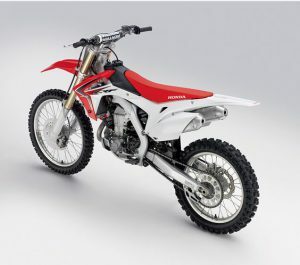 Always at the forefront of innovation, whether it’s the four-stroke thumpers you love or the two-stroke motocrossers, Honda’s dirt bike history has given the world some truly legendary machines. The history of the ‘wings’ of the Honda logo has links to its founder Soichiro Honda. He was inspired by the sculpture of the goddess Nike (the ancient Greek goddess of victory). Honda took the wings of the goddess as the basis of his logo. Honda was founded in 1949 by Soichiro Honda. He was born in a small farming village, the son of a blacksmith who repaired bicycles. He had always had an interest in automobiles and worked as a mechanic at the Art Shokai garage where he tuned cars and entered them in races. In 1937, with financing help from Kato Shichiro, Honda founded Tokai Seiki to make piston rings. After initial failures in quality control, by 1941 Honda was able to mass-produce them to an acceptable standard to Toyota. Honda sold the company to Toyota after the war and founded the Honda Technical Research Institute in 1946. With 12 men they built and sold improvised motorized bicycles using Tohatsu 50cc two-stroke generator engines. When the supply of the engines ran out, Honda began building their own copy of the engine and selling them to customers to attach to their bicycles. The Honda Technical Research Institute was liquidated in 1949 and the Honda Motor Company was formed. Honda hired Takeo Fujisawa for his business and marketing expertise, with Honda providing the technical knowledge. The partnership would last until 1973 when they both stepped down. In 1949 Honda released the first complete motorcycle, with the frame and engine built by Honda. 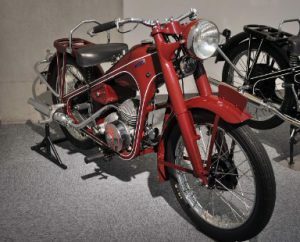 It was called the Honda Dream Type D, a 98cc two-stroke single-cylinder road bike. Production lasted til 1951 with the release of the Type E.
Honda is the largest motorcycle manufacturer in Japan and has been since 1955 when it started production. Honda made great progress largely due to the high quality and reliability of its products. In 1959 Honda began exporting to the U.S. At the time Honda’s reception was anything but wonderful. People were riding Triumphs, BSAs and Harleys. Bikers were divided into 3 basic groups: crazy outlaws, racers or people that used bikes for transport. There was no such thing as trail bikes, all bikes were street bikes. This brought about the most famous advertising campaign of all time, featuring the slogan “You meet the nicest people on a Honda.” It was a smart move given the prevailing negative stereotypes of motorcyclists in America at the time as antisocial rebels. The campaign ran for three years, and by 1963 Honda had sold 90,000 motorcycles. The rest is history. 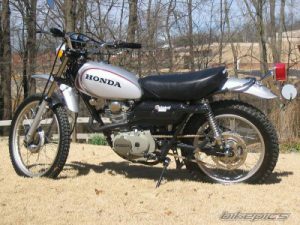 Honda continued to bring out more and better models and began producing dirt bikes in the late 60s. America and the rest of the world couldn’t get enough of them. 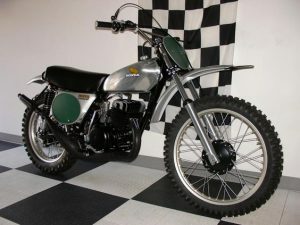 In 1972 Honda released one of the truly landmark machines, the XL250 Motorsport. It was a four-stroke single overhead cam. It had respectable power, was extremely dependable and gained a cult following among trail riders. I personally owned one, and it became the ultimate wheelie machine. 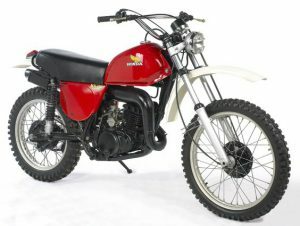 In 1973 Honda released the CR250M Elsinore, a motocross bike that was like no other. It was a two-stroke motocross weapon, and everyone wanted one. It was a sleek, lightweight beauty with a polished aluminum tank, heaps of midrange power, slim midsection and awesome styling. It weighed 214 pounds and had 7.1 inches of fork travel, which was state of the art at the time. It was soon followed up by the street legal version, the MT125, and MT250. In 1981 Honda produced it’s first water-cooled motocrosser The CR250R. In 1976 the MR250 was released to the public. It had a big 3.4-gallon tank, lights, quiet muffler and shared many of the same parts as the racing Elsinore. Enduro and desert racers loved them, but strangely they were in production for only one year. In 1979 a bike appeared that would put a dent in the XL sales. The XR250 was an enduro bike with less of the street legal clutter than the XL. It had a 23-inch front wheel, an idea of Honda’s that only lasted 2 years. A single shock version was released in 1981 and again was an instant hit. 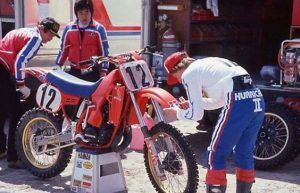 In 1983 supercross legend Bob Hannah moved from Yamaha to Honda. 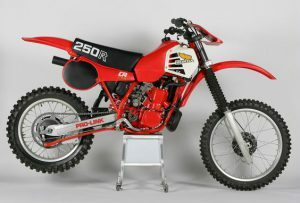 The CR250R for 1983 was the bike that he competed on and finished third in the 250 MX series. Hannah was in the later years of his racing career, and his final win came in the 250cc outdoor nationals in 1985. Since the Hannah years, the CR250Rs have improved consistently and always had a seriously good motor. Two important models were released in 1979, the XR and XL500S. They had the 23-inch front wheel and were heavy, but powerful. Modified and stripped back versions were successful in enduros. They were one of the few dirt bikes that could cruise comfortably on the road at high speed. The single shock XL and XR350 and 500 were released in 1984 and were immediate hits. Together with the XR250, they filled out Honda’s four-stroke line completely. By 1985 you could buy a 600cc XR. 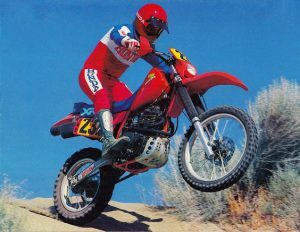 Modified versions of the XR600 and the water-cooled XR650R released in 2000 became Baja 1000 winners, and have dominated the event ridden by riders like Johnny Campbell. The bike still enjoys a loyal following today among Honda fans. The wildly successful and bulletproof XR400 was the bike of choice for Trail riders, racers and even farmers for most of the nineties. In 2004 Honda discontinued the XR400R. The late 1990’s saw the revolution of the four-stroke motocrossers led by the Yamaha YZM400F in 1998. Honda introduced the CRF series in 2000 as the successor to the XR series, which sadly was discontinued in 2002. 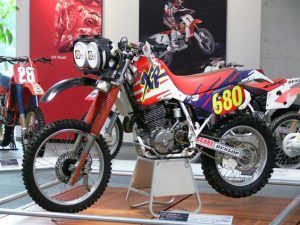 The motocross version, the CRF-R series was introduced in 2000. The CRF450R was the first of the series, followed by the CRF250R released in 2004. As of 2017, the CRF-L series included the CRF150L, CRF250L, and the mighty CFR1000L Africa Twin Adventure bike. Honda couldn’t possibly have had a better promotion of the CR Elsinore models in the 70s than they got from this commercial featuring the ‘King Of Cool’ Steve McQueen. Steve was a very competitive racer in his own right, not just a movie star who rode motorbikes. He featured in the famous 1971 movie ‘On Any Sunday’ with Malcolm Smith and Mert Lawwill. Judging by the last four decades of Honda dirt bike history, it seems we will see the giant of the industry continue to take chances and break new ground. Whatever happens, Honda intends to remain in the Number One spot. What’s your favorite Honda dirt bike? Have you have owned one of the legendary models mentioned in this post, please feel free to share your story in the comments below. thanks for the walk down history lane greg. it felt like you were describing the progression of bikes going through my dads garage as I was growing up. One more point I want to add is that the Honda owners groups I see at the motorsport events are definitely the biggest, best and most organised. I just wish that one of the manufacturers would create a lighter, mid range adventure bike suitable for those of us who are 6 foot 6. Thanks for your comments, Remy. Great that your Dad had bikes when you were growing up. Did you get to go riding with him? A great mid-range light adventure bike I can highly recommend is the Suzuki DRZ650. A friend of mine rode one around the world, they’re bulletproof. If you’re 6 foot 6 it must be an advantage with dirt bikes these days. Most of them are so tall due to the long travel suspension. Adventure bikes don’t tend to be so tall, due to their weight and bulk. When loaded up they are a handful to pick up if you fall off. If you’re looking for a light mid-range adventure bike, check out my post ‘Are Big Adventure Bikes Really Necessary‘ I review a couple in that post, it may be of some help.